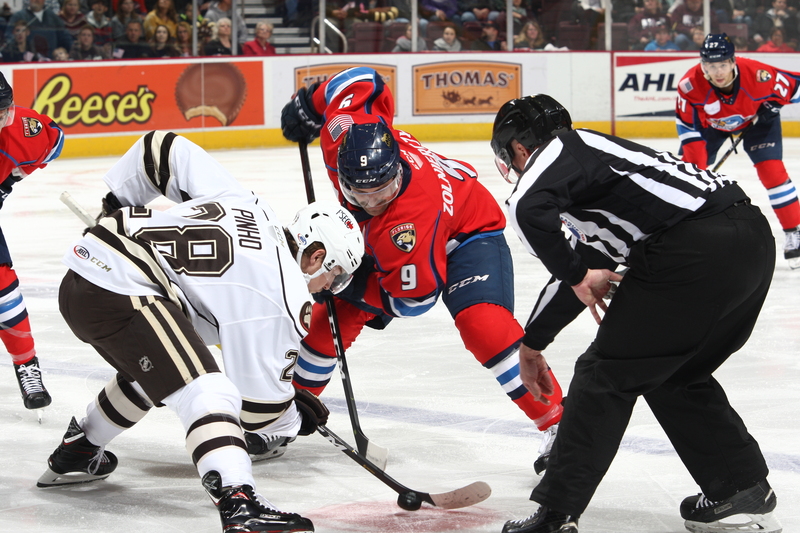 The Hershey Bears downed the Springfield Thunderbirds 3-2 Saturday night at Giant Center in Hershey. 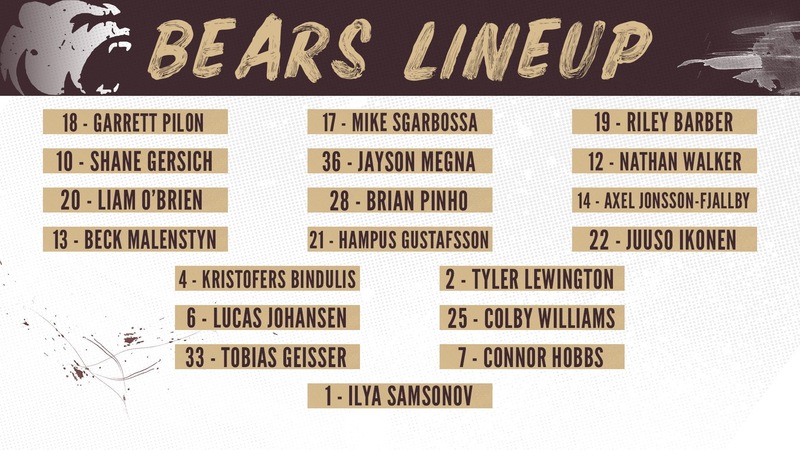 The Bears scored three power play goals and Ilya Samsonov stopped 31 of 33 shots for the victory. The win improves the Bears record to 7-7-0-1. After starting the season 0-5-0, the Bears have gone 7-2-1, with points in 8 of their last 10 games. The Bears now hit the road for a tilt with the Crunch in Syracuse on Sunday. Puck drop is set for 5:00 PM. The Bears would start the game with a pair of power play goals (Megna and Walker) before the Thunderbirds answered, making it 2-1 at the first intermission. After a scoreless middle frame, Riley Barber would add a power play goal just 24 seconds into the final frame to make it 3-1. The Thunderbirds would cut the Bears lead to a 3-2 with a goal at the midway point of the final frame, but that would be it, as the Bears would hang on for the 3-2 win. Nathan Walker returned to the Bears lineup after being waived by the Capitals and reassigned to the Bears on 11/5. Jonas Siegenthaler and Aaron Ness were recalled by the Capitals on 11/9 to fill in for John Carlson and Brooks Orpik, who were dealing with injuries. The Bears would open the scoring with a power play goal from Jayson Megna at 6:46 of the first period. The goal was the Bears first power play goal at home this season. Shane Gersich and Connor Hobbs were credited with the assists. The Bears would make it 2-0 with their second power play goal at 12:13 of the opening frame. Nathan Walker would be credited with the tally. Garrett Pilon and Riley Barber we’re credited with the helpers. The Thunderbirds would cut the Bears lead in half with a goal from Jayce Hawryluk at 14:17 of the first period. With three minutes remaining in the period, the Thunderbirds would get their first power play of the game, but the Bears would kill the penalty, their 33rd consecutive kill. The period would end with the Bears leading 2-1. The Thunderbirds outshot the Bears 8-5. The Bears were 2 for 2 and the Thunderbirds were 0 for 1 on the power play. The Bears and Thunderbirds would go scoreless in the middle frame. The Bears outshot the Birds 8-7 for the middle frame, and trailed 15-13 after 40 minutes of play. The Bears were 2 for 4 and the Thunderbirds 0 for 3 on the power play after two periods of play. The Bears would begin the final stanza with a 5-on-3 power play, and they would capitalize with a goal from Riley Barber, just 24 seconds into the final frame, making it 3-1. Mike Sgarbossa and Garrett Pilon we’re credited with the assists. The Thunderbirds would cut the Bears lead to 3-2 with a goal from Thomas Schemitsch at 10:10 of the third period. The Bears would hang on for the 3-2 victory. The Bears were 3 for 6 and the Thunderbirds were 0 for 6 on the power play. Ilya Samsonov stopped 31 of 33 shots faced for a .939 save percentage. The Thunderbirds outshot the Bears 33-17. Riley Barber led the Bears in shots with 5 for the game. Connor Hobbs had 3 shots. The Bears penalty kill has killed 38 consecutive power plays – 8 straight games. Annual hockey game road trip. This entry was posted in News and tagged Hershey Bears, Jayson Megna, Jon Sorensen, Nathan Walker, Riley Barber, Springfield Thunderbirds. Bookmark the permalink. Samsonov voted 1st star, with 30 saves in 32 attempts. Bears were outshot by a lot.